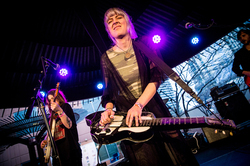 Sisters Rebecca and Megan Lovell make up Larkin Poe, who performed at the 2018 Southwest Invasion. The sisters cut their teeth as session players for albums by T Bone Burnett and Steven Tyler, and backing musicians for artists such as Conor Oberst, Elvis Costello and more. In 2014 they released their first album, KIN, bringing their blend of roots rock to a new and appreciative audience. Their second album RESKINNED came out in 2016 followed by 2017’s PEACH, which was deemed “a bold album written by brave songwriters who trust their abilities and instincts” by Blues Rock Review.